Most people think the creative process finishes once the art has been produced. This artwork is the perfect example of proving those people wrong; I had already finished some of my abstract seascapes and was very happy with the relaxing and calming feelings they were transmitting which was my goal, however. something was missing until I saw this one. Matted Print 8x10 inches: Print size 8x10 inches (matted total size 11x14 inches) hand signed and titled on the mat. WALL DECOR STYLE TIPS: This picture would be the perfect addition to any room with a beachy, nautical theme and follows the current trend for all things coastal. The pop colors colors will offer a strong presence to all those who dream of life on the beach and playing in the surf of the Atlantic Ocean. EASY TO FRAME: This matted print fits a standard 11x14 inches frame that can be found pretty much everywhere but If for some reason you prefer to isolate the print so that you can use alternative framing solutions like a bigger mat or with no mat within an 8x10 frame, that's no problem! You can easily detach the print from the mat by carefully un-peeling the 2 strips of archive tape that attach the print to the mat board. LOOKING FOR THE PERFECT GIFT? This matted print is aesthetically perfect for being considered the choice for your next gift hunting. WANT A DIFFERENT OPTION? I also offer this print in other sizes and materials such as a canvas, aluminum, plexi, or as a framed print. ANY HELP? : Contact me directly, I have been dealing with art galleries for more than 10 years so I have probably already heard what you are looking for, and if not, awesome! I love new challenges. If you have any questions about this product by Roman Gerardo Miami Beach Fine Art Photography Prints, contact us by completing and submitting the form below. If you are looking for a specif part number, please include it with your message. 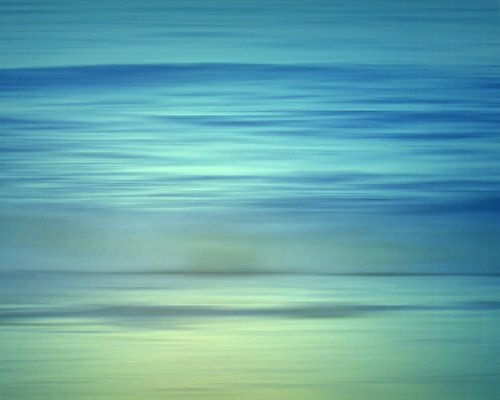 Blue Abstract Wall Art Decor, Beach Photography, Contemporary Artwork,Sapphire Waters.